Puzzle platforming with manipulation of primary colors. Limbo and Boxboy but want to take it nice and easy. 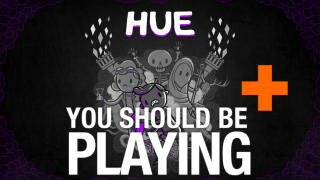 Hue, an arty and unassuming platformer by Fiddlestick Games, is one of the most pleasurably meditative games I’ve played in the past year. Gaming and meditation are acts linked together regularly when discussing thoughtful games that veer hard away from the kinetic twitchiness or grand theatrics of big budget hits. We take slow-paced exploration like No Man’s Sky or low stakes, high atmosphere style pieces like Abzu (which has a literal meditation button in it), and we equate their steady pacing to the act of deep breathing and chanting, “Om.” The actual practice of meditating is difficult, though. Contradictory by its very nature, meditation requires you to both by wholly inattentive but wholly present, willing to let stray thoughts slide off your consciousness like so much water off a duck while staying awake and even alert. Gliding over Hue’s delicately detailed platforms, taking its hushed world and manipulating colors to reveal new facets of the environment readily guides you into that state; present, thoughtful, but not so demanding that your conscious mind is fixated. It takes playing Hue to appreciate its subtle pleasures, though. From the outside it looks like another entry in the long line of art platformers that have sprung up in the past decade, most specifically Limbo. Like Playdead’s famous horror comedy, Hue also stars a non-descript shadow boy who’s more outline with big eyes than a defined person, matching an equally grey and dreary world. Rather than an atmospheric choice, though, the lack of color and definition in Hue is central to the game’s story and play. As a mysterious companion tells you through narrated letters found in the game as you jump through its silhouette caves, towns, and weird forests, there are more colors in the world than you can readily perceive. She’s no longer visible in your spectrum thanks to dealings with the mysterious Dr. Grey--it’s not all subtle--and you’re ostensibly trying to reach her. Doing so involves finding those new colors, each of them primary, and selecting them from a wheel to change the look of the world. Changing colors changes the environment. If you need to clear a blue box in front of you, switch the world to blue to make it vanish. Switching to blue may make a purple box appear, though, so you have to alternate to clear a path. Hue could quickly become frustrating or tedious if its puzzles were more oblique, but it strikes an elegant balance between true brain busters and push-over challenges. Take the mental calisthenics of Portal and marry them to a molasses smooth, slow version of Super Meat Boy’s platforming and you can get an idea of the feel at Hue’s core. The result is game that is beautiful but not so mesmerizing you get lost, considerate but never simple. When I was playing it I felt present, not planning too far ahead or straining against a specific challenge. Zen indeed.